With a precision engineering pedigree, PRM Newage Ltd has established an enviable reputation as a specialist in the design and manufacture of high efficiency mechanical driveline equipment. From its roots at the birth of the UK automotive industry, the company has evolved a product range that encompasses a wide variety of driveline solutions, such as the NEWAGE brand of Off-Highway and Ground Support axles, as well as the world renowned PRM gearbox range for Marine applications. In addition, PRM Newage supplies finished products for new generation, special purpose vehicles, and provides sub-contract services for leading manufacturing organisations. 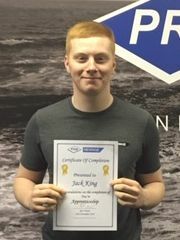 Well done to Jack King who today completed his Engineering Apprenticeship. Jack will now move to the Electric Drive Axle Assembly Area.